Medical errors due to patient misidentification are a serious issue for all healthcare providers and are currently the third leading cause of death in the U.S. with 60% of those errors due to identity issues. Medical errors due to patient misidentification only promises to rise faster with the advent of electronic health records and the increase in data sharing. To address this problem, RightPatient introduces PatientLens™, which turns any off-the-shelf smartphone or tablet into a reliable patient identification device, empowering clinicians to accurately recognize patients through its combination of biometrics and deep learning capabilities. RightPatient provides the software download links allowing eligible clinicians the ability to quickly and easily download the PatientLens app on any smart device equipped with a camera. PatientLens activates the camera on a smart device that allows clinicians to quickly capture a patient’s photo, even if they are unconscious. PatientLens captures an image of the patient’s face which is submitted to the RightPatient® Cloud for fast, accurate matching results. 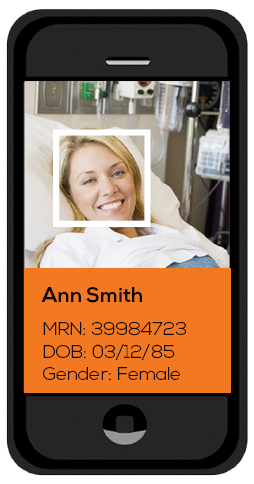 Upon successful verification, PatientLens displays basic patient demographic information including name, medical record number, D.O.B., and gender to ensure safe care delivery and to humanize the patient experience.